Scrap tyres of any kind are in good hands at KURZ Karkassenhandel. 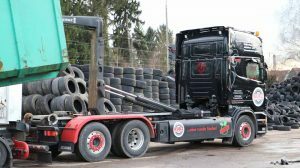 We take car, HGV, light commercial vehicle, tractor, earth mover, solid rubber, motorcycle, bicycle and commercial vehicle tyres, in any condition, any size and any make, in small quantities from private individuals or container loads from tyre dealers: It doesn’t matter. If you are disposing of used or scrap tyres, we are the ones to call. You can rely on our professionalism and experience: Every tyre is checked by experts and taken for suitable recycling. You can request scrap tyre collection: We will then send a transporter to you who will take away the tyres. We would be pleased to provide you with a container for collection. Our bring your tyres to us. We are available to you in Wendlingen and Landau (Pfalz) during normal opening hours. It is particularly easy if you register with us as a customer on the web site: You personal information is then uploaded in the online order form. Because of the current market situation – many recycling companies have stopped accepting tyres because their capacity has been used up – we would like to point out that we are only accepting registered deliveries for the time being. Scrap tyre disposal is a demanding task which should be in professional, experienced hands. Because scrap tyres are not always scrap tyres. The professional makes a distinction between carcasses and profiled tyres: The profiled tyre still has a residual tread, as the name implies. The carcass, on the other hand, is what remains when the tread of a tyre has completely worn off. Profiled tyres are either for exporting to countries in which fast speeds are not possible because of the road conditions, or for retreading like the carcasses – provided that they have not already been retreaded once. Of course, this can only be done if they are undamaged and have not been driven at speeds of faster than 210 km/h. Several tests are carried out in order to determine whether a tyre is suitable for retreading. Only tyres that do not come into question for the above-mentioned uses are taken for material or thermal recycling. During retreading, the tread of the carcass is “peeled off” and a new one is fitted. A car tyre can be retreaded once (provided that it is undamaged), and HGV and aircraft tyres can be retreaded several times. This method not only has the advantage that less waste is produced and resources are protected, but about 70 percent of energy is saved during production. It’s really a win-win situation, but unfortunately the demand for retreaded tyres is falling. The reason for this are cheap new tyres from the Far East which are flooding onto the market. Many car drivers are dubious about retreaded tyres. They want a new tyre, even if the quality it not as good as the retreaded tyre. Material recycling takes place in so-called granulating companies. Here the scrap tyres are turned into granulate in huge machines and then ground into fine or coarse rubber powder. This rubber powder is a valuable raw material. Surfaces for sports stadiums or fall protection mats for swimming pools and playgrounds are manufactured from this. Many uses from shoe soles to seals are possible. Rubber powder is also extremely suitable for mixing with bitumen in road construction. “Rubber asphalt” is quieter, has better drainage capability, is safer and lasts for longer. Unfortunately, the use thereof has been slow to take off in Germany to date. If this situation changed, it would be a big step for scrap tyre disposal. Old tyres are also an excellent secondary fuel and are used instead of fossil fuels, such as raw or crude oil and coal in cement factories, for example. The use of scrap tyres as a fuel therefore saves valuable, non-renewable raw materials. Furthermore, the organic pollutants which are contained within tyres are completely and harmlessly combusted at the temperatures which are reached in the furnaces and after the exhaust has been cleaned. In order for every scrap tyre to be taken for recycling using a suitable method, it must be professionally checked after delivery. This is carried out by scrap tyre experts at KURZ Karkassenhandel. Good used tyres are exported or retreaded, and all others are recycled. 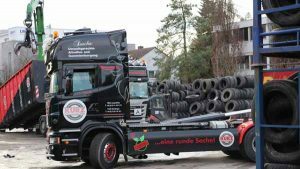 With more than 60 years of experience in scrap tyre disposal, KURZ Karkassenhandel is the guarantee of economical, environmentally friendly disposal in accordance with the legal specifications.